Few of Homer's watercolors rival this one for its effects of shimmering sunlight and steamy atmosphere, achieved through the rapid application of wet-on-wet surfaces, the broad and dexterous exploitation of the white paper reserve, and the judicious sponging of wet pigment, especially in the shadows, reflecting light off the water. 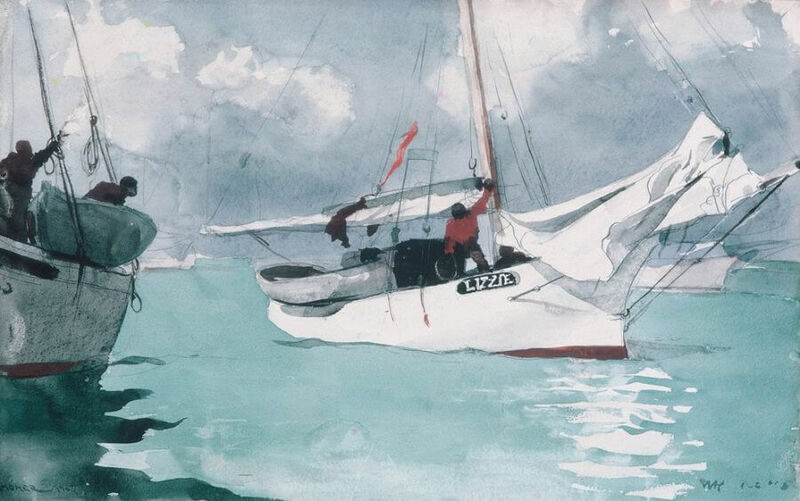 This picture is also exceptional for the number and visibility of its pencil marks, not only to indicate some of the boats' rigging (and betraying the pentimento of a sloop in the background that the artist edited out), but also to enliven the rustle of the sailcloth lifted by a phantom breeze. By contrast, Homer, in masterly fashion, merely daubed in the figures freehand, sacrificing nothing of their form and weight - they even seem to speak.